HandKrafted by Stephanie: Viva La Verve.. CASE Jackie! Viva La Verve.. CASE Jackie! Hello! I found some time to play along in Viva La Verve October week 3. The challenge, in honor of Verve Diva, Jackie's recent induction into the SCS Dirty Dozen, is to CASE one of her creations! I adore Jackie's style, so it was tough to choose just one, but in the end, I chose this one. My sentiment is from Verve's Big Wish. I used some patterned paper from October Afternoon and PTI, Kraft cardstock and ruffled some ribbon. I added some ink distressing and my pearls are from Pizazz Aplenty. A little while ago, Jackie also shared that she is the "Sunshine Mom" at her daughter's school. She makes birthday cards for the PTA to give to the teachers. I thought that was really such a great way to volunteer at school by doing what I love (stamping!).. So, I pitched the idea to the PTA President at Sabrina's school, and she loved it! This is the first card I'll be contributing. So, Congrats, Jackie on being named to the "Dirt Pile" and thanks for all of the fabulous inspiration! Accessories: Classic Oval and Scalloped Classic Oval Nestabilities, Star Nestabilities (Spellbinders), Medium Scalloped Border die, Button (Papertrey Ink), Swiss Dots embossing folder (Provo Craft), Twine (May Arts), Red twill, Foam tape, Thread, Sewing machine. ACK!! I just love this, Steph! (much better than my version, BTW!) And congrats to you fellow "Sunshine MOM"....awesome! What an adorable card Stephanie! Love the fun color combo & darling embossed heart! I am SURE this card will bring a whole lot of happiness to someone's day! What an awesome volunteer position for you Stephanie! Such a nice combo! I really like this card... everything looks balanced. This is GORGEOUS Steph! LOVE the colors and layout on this! The scallops are SO fun!! 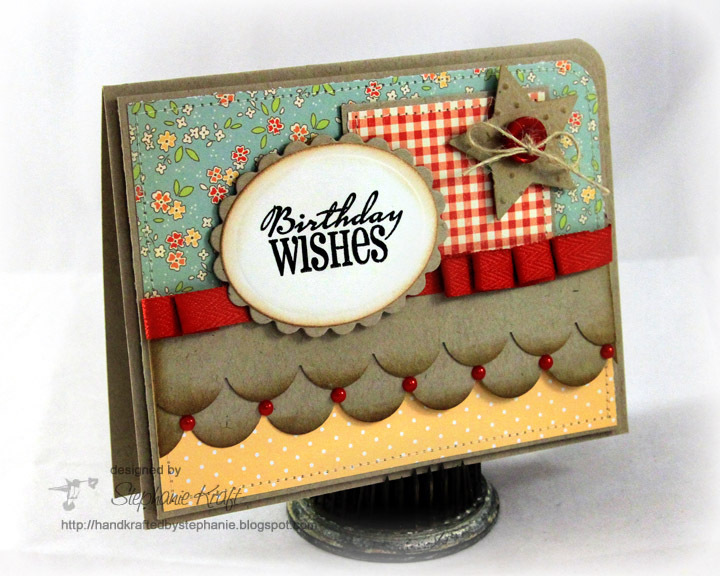 Love the vintage feel to this card! The distressed scalloped edges are the perfect touch!